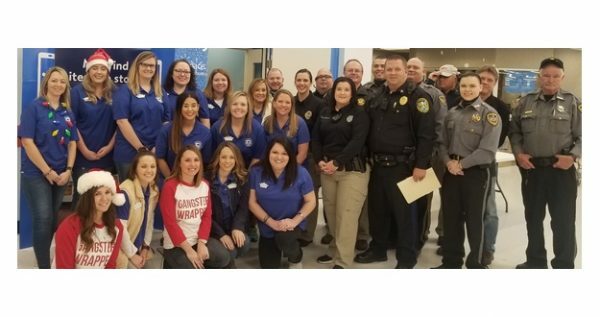 A partnership between Junior Auxiliary of Mountain Home and the Fraternal Order of Police during Shop with a Cop brought meals to 35 families and 87 children during the Christmas season. This was the fourth year JA partnered with the FOP for its Shop with a Cop project, Food for Families. Junior Auxiliary members provided a Christmas meal for the families whose children participated in Shop with a Cop, including staples like ham, milk, potatoes, green beans, corn, pumpkin pie and more. Families had as few as one child to those with five children. A total of 87 children from around the area were able to purchase Christmas gifts at Walmart, as they shopped with local law enforcement. McDonalds at Walmart provided each of the children a breakfast sandwich before they left the store. Junior Auxiliary members also wrapped the gifts for the children to put under their trees. 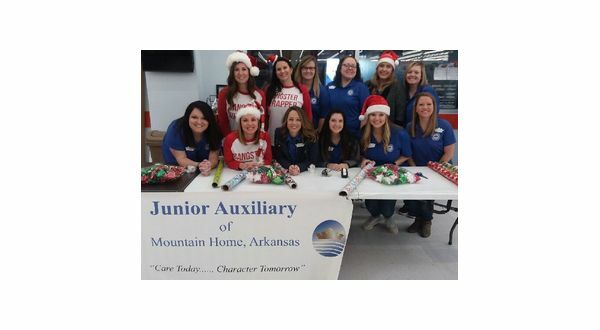 Junior Auxiliary of Mountain Home was founded in 1996. The organization's motto is Care Today ~ Character Tomorrow. Photo: Junior Auxiliary members and local law enforcement officers partnered for the fourth year for Shop with a Cop's Food for Families project. Photo: Junior Auxiliary members at the table where Shop with a Cop presents were wrapped for 87 children.